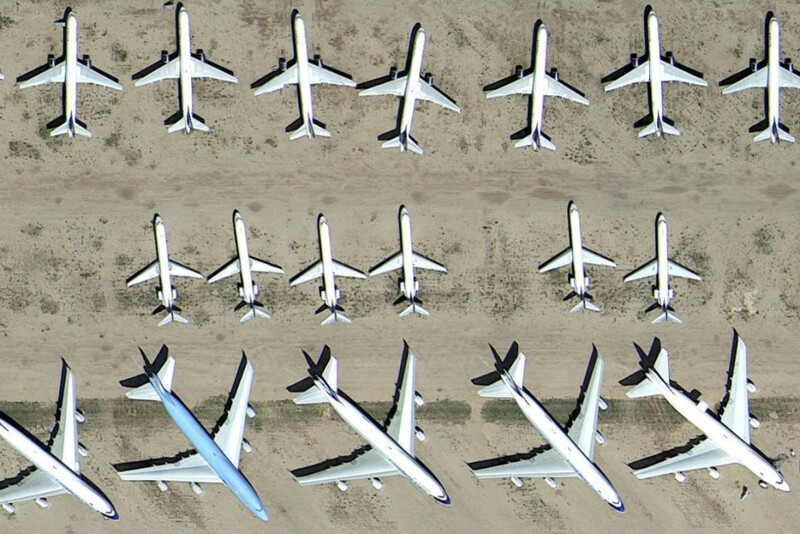 There are a number of storage airports in the western United States known to aviation enthusiasts, with row upon row of retired and stored airliners parked up awaiting their fate. Largest among these are Mojave, Victorville, and Marana Pinal Airpark. The latter, located to the north of Tucson in Arizona, is notoriously difficult to get close to for the enthusiast, with guards manning the entrance, which in itself is a long way from any views of aircraft. In fact, the standard way for an enthusiast to see airliners parked at Marana is to hire a private aircraft and pilot to fly them from Tucson to Marana, performing a number of low approaches, or a landing and slow taxi for takeoff, snapping photographs frantically in the hope of catching everything parked there, and preferably the registrations. Then a period of research would begin to work out exactly what was seen. However, times are hard for Marana. It urgently needs to repair its runway, and to find new income streams to keep it in business. As a result it is looking at ways to attract more people to the site, and one of the first changes has been the removal of the guard posts blocking the entrance to the former military airport. Jim Petty is the airport’s economic development director and knows exactly the draw that Marana has on enthusiasts and the curious public who have a fascination with the huge hulks of metal glinting in the sun, some sporting airline liveries of yesteryear, whilst others appear to be factory fresh. For most enthusiasts, storage airports have been a place to catch up with missed aircraft, sometimes classic old jets rarely seen in active service anymore. However, places like Marana offer a good mix, with some aircraft temporarily stored straight from the factory as airlines face economic problems or leasing companies find it difficult to place them. Other aircraft still have a lot of life in them, but come to Marana to await a new customer. Whilst enthusiasts will not be given free reign of the airport under its new relaxed rules, Petty has begun offering tours of Pinal Airpark in an SUV, stopping off to take in the different areas of parked airliners, and to watch a variety of different aircraft that still use the active airport. Marana’s former locked-down security stance came from its long-standing involvement with the CIA, acting as a staging post for secret operations which were closely guarded from the public eye. It was also a military training post. However, Marana is officially listed as a general aviation airfield, and as such should be accessible to the general public. And so it now is. Jim Petty may live to regret news of this opening of Marana for tours becoming public, as enthusiasts are sure to be planning trips already. But nevertheless, this is great news and I’m sure will be very much appreciated. I will certainly be taking the opportunity if I am in the area! Free tours are by appointment only and subject to availability. Call Jim Petty, 520-866-6545.
great news.long time sinces been.can some body put out a storage list.thank you. I have never visited here or any of the other storage facilities and would love to at some stage. Hopefully this may prompt the others to do something similar. As I help keeping a aircraft database the information from these sites is invaluable. However the main airport area still lock down to visitors, I only allow to drive in a few roads. I was tried to taking pictures and a security guards came and said no to me… I guess the only chance still be the tours, if there is a tour. Is it necessary to make a reservation on advance to visit Macara from the ground ? What is the fee to visit ? I would love a tour since the 747’s are being retired there. I would like to drive up from Phx. I’ll look into this. Hi I don’t think you can do it at Marana, but they have 747s at many museums around the world, such as the Delta Museum at Atlanta, Museum of Flight Seattle, plus the Jumbo Hostel at Stockholm Arlanda! 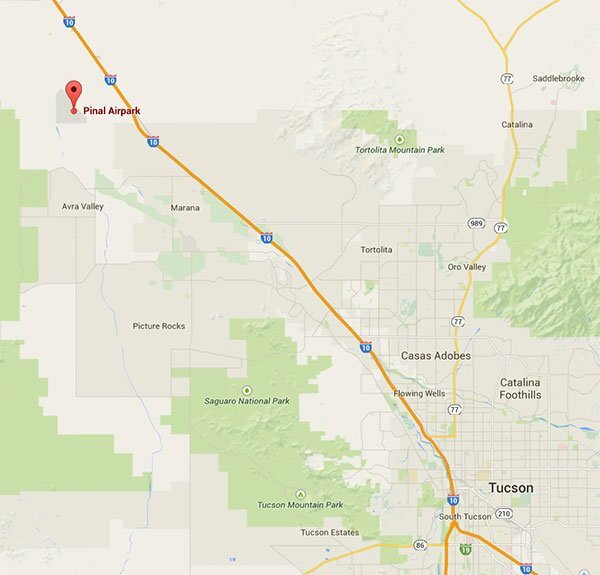 I was lucky enough to tour the Pinal air park with Jim Petty last May. It was difficult to get in touch with him. Once I did, it was well worth the wait. We were able to walk around 2 rows of 747’s. And take as many pictures as we wanted. Darren is correct that it can be difficult to reach Mr. Petty. Apparently, he fills two important roles with Pinal County, and he’s a pretty busy man. I was able to reach him on short notice in mid-December; I inquired about scheduling a tour for my Dad as a birthday present. Mr. Petty followed up a few days later and we locked down a date and time to do the tour. Amazingly, he offers these tours for free, schedule permitting, and he agreed my dad’s request to bring a friend along. Thanks for that insight Chris!